Hi! In the post I would like to consider important topic of filtering data in ABAP CDS views. I’d like to thank Sergey Shablykin for close collaboration. Without his participation, knowledge and experience the post would not have appeared. Syntax of using parameters is considered in SAP documentation. In the table below there are pros and cons of parameters functionality. In my opinion current limitations strongly restrinct area or parameters usage. Parameters are suitable for transfering to logic some numeric values used in calculations of key figures or may be to split complex logic at different scenarios. Usually I try to write a default value and to hide parameter so business user couldn’t see it. Of course you notice that I write only one limitation in right part of table. Will filtration by variables in ABAP CDS views be pushed down to the most bottom level? This question used to appear very often in case of S/4HANA and (its part) Embedded Analytics promotion. Nowadays if you have S/4HANA the main stream is not to create “old” ALV reports or develop all analytical reports in separate SAP BW system. You could use embedded analytics and create reports directly in S/4HANA based on ABAP CDS views. They are not considered here, for more information see post. The following model was used for testing. 1.2. Master data table of sales managers contains language dependent text and sales groups. They combined in one table only for minimization of data preparation and manual data input. Number of records is 9. 3.2. Execute with following debug options for analysis performance and generated SQL from application server side of view. 3.3. Enter variables. Restrict year and sales group to analyse where and how filtration will be transfered and executed. 3.4. Get resulted sql statement and find restrictions in where clause. Only sales group 1 and sales managers of this group (see master data in paragraph 1.2). Please note, that texts are shown in english as expected (you could find more information about time-dependent attributes and language-dependent texts in blog). 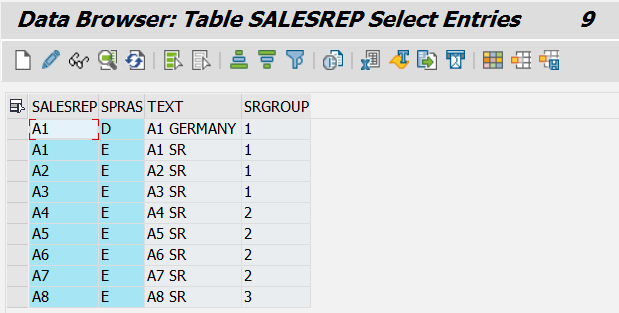 In master data table we have 1 test record in german with sales group A1. 3.6. Query Statistics show that Total Number of Read Records in 3744 and Total Number of Transported Records 936. But this statistics could not demonstrate how this filtration and aggregation result performed at DB level (I mean logic push-down exist or not exist). 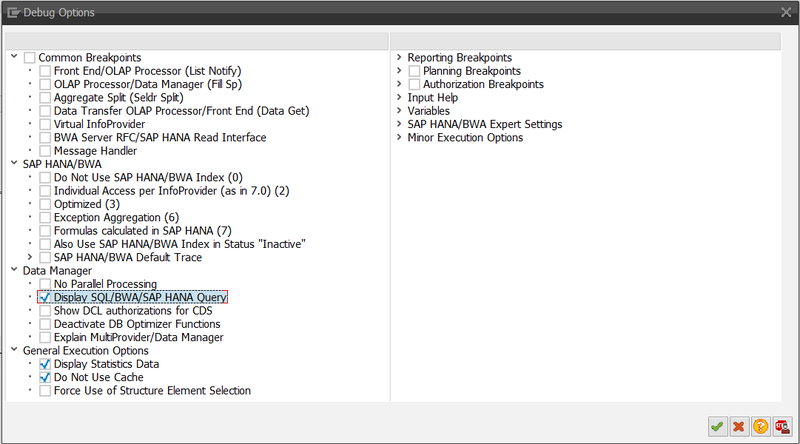 To understand how exactly filtration and aggregation from 133 848 to 936 records performed we need to analyse HANA SQL Trace. 4.1. 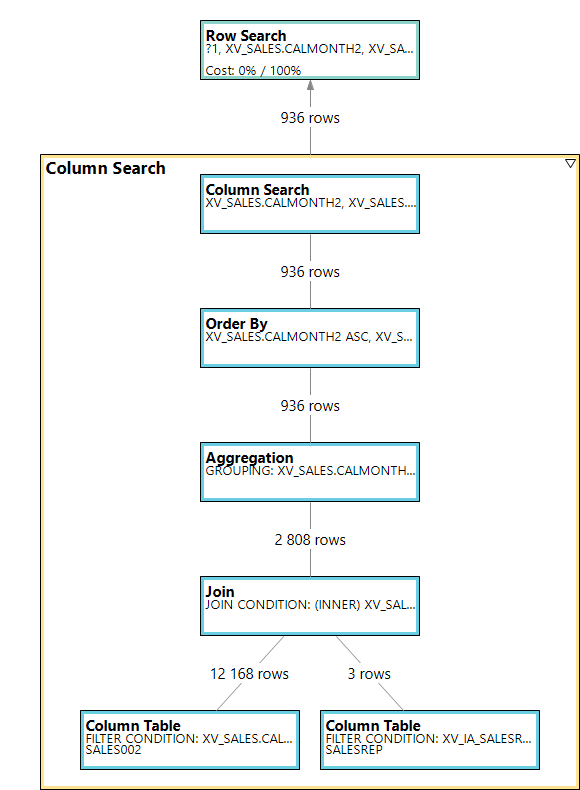 Switch on SQL Trace on at Administration – Trace Configuration – SQL Trace. 4.2. 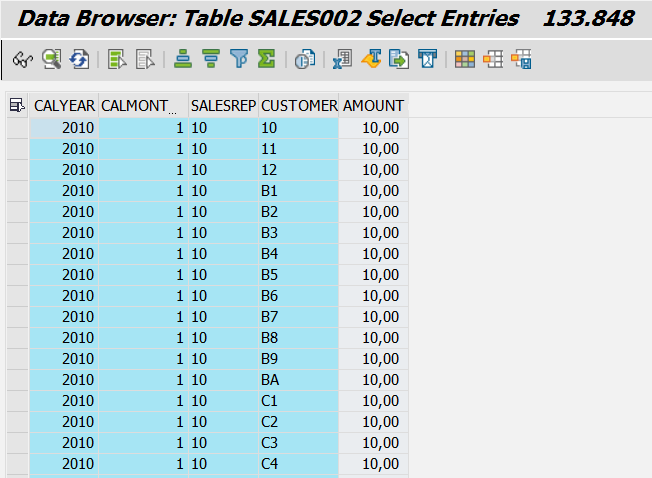 Run analytical report in RSRT, stop SQL Trace and analyse the results. FROM /* Entity name: XVCSALES */ "XV_C_SALES" "A1"
WHERE "CALYEAR" = ? AND "SRGROUP1" = ? Enter for CALYEAR and SRGROUP1 values 2016 and 1 accordingly. We have 2 filtering conditions by year and by sales group. 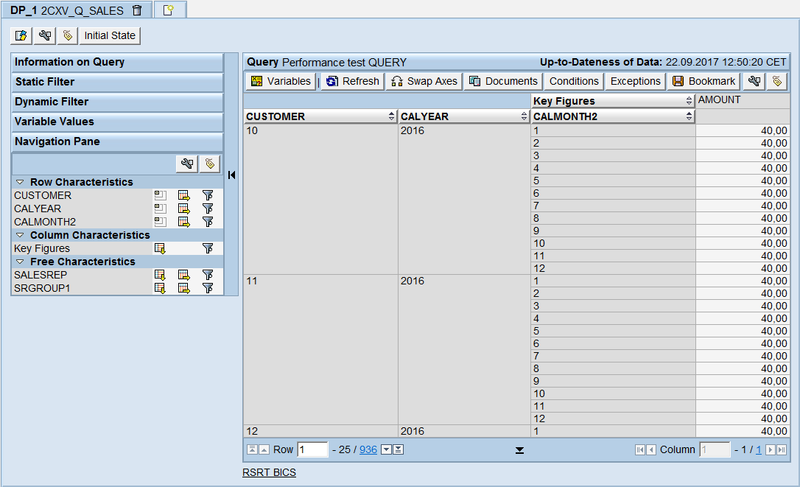 In the Execution Plan we see that filtration performed at bottom level in HANA DB. Filtration by variables in ABAP CDS views is pushed down to the most bottom level!